Sapient Capital PartnersTM has over 80 years of experience as principals and advisors. Sapient brings to the table its experience as business executives, financial advisors and principals when guiding its clients through the complexities of business mergers and acquisitions. Our services in this area include target search, target due diligence and financial modeling, transaction assessment and valuation, deal structuring and negotiation, legal, tax and accounting liaison, and raising capital if required. We will manage the entire process, from introductions and preparatory analysis and information gathering right to closing–to minimize the demands on and disruptions to our client, who still have a business to run. Sapient believes strongly in bringing a well-honed process and discipline to any divestiture situation in order to maximize the likelihood of a successful outcome. The partners at Sapient have extensive experience in managing divestitures from the concept point right through to successful completion. We will bring our experience to the transaction to help determine the right approach to marketing the business, whether it is through mass marketing of the business opportunity, a select invitation process, or something in between. We have a particularly broad and deep level of experience in family-owned or operator-owned companies and can help with matters relating to succession and exit planning. You want to start stepping back, but not completely yet. You realize that your company needs to do something significant, yet fundamental to continue to be successful – perhaps merge with, sell to, or acquire a complementary business. Decide what to do with your businesses and when. Maintain and maximize shareholder value through the process. Avoid disrupting the growth arc of your business in the process. You may decide to change your mind and maintain the status quo after going through this process —you need to have the ability to do this in order to make truly rational decisions. Help you make decisions based on analysis and experience, not guesswork. Our services in this area include; valuation, capital sourcing, negotiations, deal structuring and other critical elements to ensure a successful transaction is executed. We have extensive experience advising and assembling buying groups as well as advising the selling shareholder or shareholders. We are uniquely qualified to help you through the careful balancing and complexity of what is often a multi-party transaction, with the buyer(s), the seller(s) and the third party capital provider(s)–we have been through the process as advisors, as financiers and as principals. 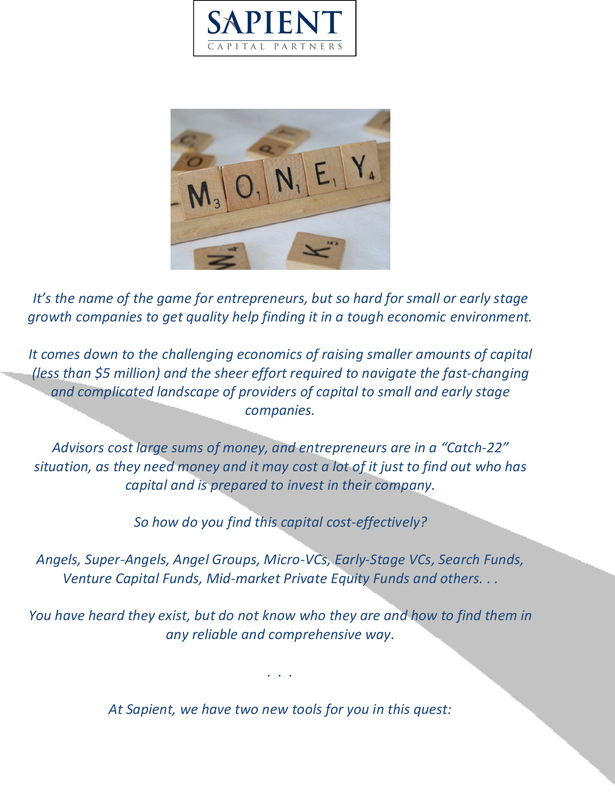 Whether you need funds to fuel organic growth, support the acquisition of a business or additional equipment, or for any other purpose, the partners at Sapient Capital have extensive experience to help guide you around all four corners of the capital world to help you optimize your capital markets strategy. Our long experience with private and public capital markets, and all types of senior and subordinated debt and equity allow us to help you determine the optimal capital structure for your company and the strategy and timeline to attain it, as well as to assist you with evaluating your options and the risk and unique features of each. We actively monitor capital markets and mergers & acquisitions market conditions and actively maintain a proprietary database with over 1,800 angel groups, super angels, venture capital funds, mid-market private equity funds, venture debt & mid-market mezzanine debt providers, and other specialty funds and providers focused on small- to medium-sized private companies and high-growth companies. Our database spans our target geographical markets in Canada and the U.S.
We prepare business valuations and value assessments for mergers & acquisitions; divestitures and reorganizations; Employee Stock Option Plans (ESOPs); management buy-outs and buy-ins; capital raising; and shareholder disputes. Sapient’s partners have a wealth of operational and management experience in everything from start-ups to high-growth companies. Where the situation warrants, we would be pleased to discuss how we may be able to fill out key areas of your team to achieve specific, tangible goals such as a turnaround, merger or a sale of the company, a financing or an IPO. We will add specific insight and resources without adding complexity to your situation or your organizational structure. We exit simply and quietly when our objectives are completed or whenever it suits you. We would be pleased to discuss our “Virtual CFO”, “Virtual COO” and “Virtual CEO” arrangements. “Look-see” reviews for underperforming or “stuck” companies. We also provide on-going advice and support for companies. We sit on select Advisory Boards and provide Periodic Progress Reviews for Boards of Directors. What if you are not sure what service, if any, you need? We have the experience to help you determine what the best course of action is in any circumstance. We are not “product specialists”, so we do not have any bias or interest in selling you on any particular product or service–our interest is in giving you the best and most objective advice regarding your strategic direction. Strategic Assessments: We can cost-effectively show you the effect of different strategies where it counts–the value of your company or investment. We can give you a tool to evaluate your options, assess the risks and determine realistic expectations. 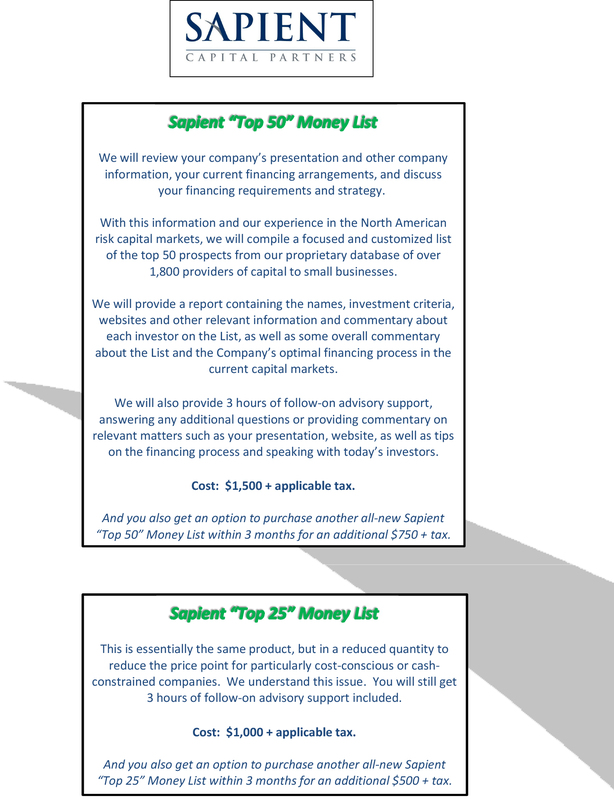 “Sapient Capital Partners” is a trademark of Sapient Capital Partners Corporation.